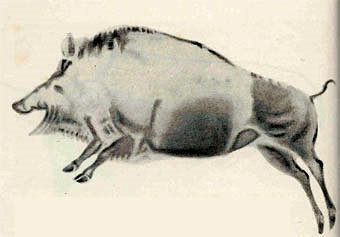 A galloping boar, copies exactly from the unlit depths of the Altamira caverns, this work of art shows the most vigorous traits and exact observation combined with real anatomical knowledge. Yet it was drawn by a semi-savage hunter perhaps 10,000 years before the Pyramids were built. The mass of work of equally high artistic merit executed here and in other caves in Spain and France makes it impossible to dismiss it as a nicely fortuitous achievement. 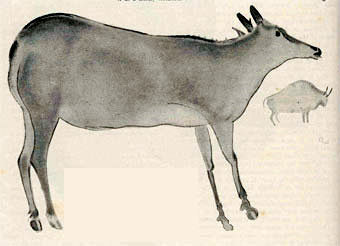 This delicate drawing of a red deer could hardly be surpassed by any modern painter of animal life although it was "hung" in its palaeolthic gallery something like 15,000 years ago.